This story originally ran on June 15, 2017. We’re repubbing it given the network’s multiple Emmy wins Sunday night, including Best Drama. Given its current status as one of the foundational networks of the Peak TV era, it’s easy to forget that prior to the premiere of The Shield in 2002, FX was a sleepy little cable backwater known primarily for reruns of Buffy the Vampire Slayer and The X-Files. Likewise, before Mad Men’s arrival ten years ago next month, AMC was thought of as the poor man’s version of Turner Classic Movies, while Netflix was just a fancy way to watch old movies and TV shows until House of Cards heralded the arrival of must-binge TV. A single successful series does not necessarily a network (or streaming service) make, but TV history has shown time and again that the right kind of hit can absolutely be transformative. Now comes Hulu’s The Handmaid’s Tale, the Elisabeth Moss–led dystopian drama destined to be remembered as one of the best series of 2017. With it, the streaming stalwart seems to have found its paradigm-shifting success. Its challenge: making sure Handmaid’s early blessings resonate well beyond the Emmys and critics’ year-end lists. Netflix got lucky almost right out of the gate with its originals, scoring back-to-back successes with House of Cards and Orange Is the New Black in 2013, just a year after the world greeted Lilyhammer with a shrug. Hulu has been a bit slower making noise. It’s not that the streamer’s originals have been flops — hardly. Comedies Difficult People, Casual, and even the low-budget reality parody The Hotwives have generated solid buzz and good reviews. Saving The Mindy Project from cancellation at Fox yielded success, sending a message to consumers and Hollywood’s creative community that Hulu was committed to quality original programming. Last fall’s limited drama series 11.22.63 made a moderate splash, helping bring some of Stephen King’s legion of fans to the service. Hulu has also made inroads with specific demographics through some of its library additions. It was the first streamer to land full series rights to Seinfeld and The Golden Girls, two of the biggest comedy titles of the past 30 years. And while it doesn’t get much attention, Hulu has become a premiere streaming destination for anime, something execs at the service point to with particular pride. Less quantifiable, but in some ways nearly as important, is the extent to which Handmaid’s has cut through the pop-culture clutter. “There is a conversation around Handmaid’s Tale that is certainly more intense — and I mean intense in a good way — than any other series we’ve had, [even] those that have been widely consumed,” Erwich says. It takes nothing away from the quality of the show to note that Handmaid’s has also been the beneficiary of exquisite timing, arriving during the first 100 days of the Trump presidency. Fears of Trump’s own authoritarian tendencies meshed with the show’s bleak dramatization of author Margaret Atwood’s fictional police state, resulting in mainstream and social media coverage of Handmaid’s well beyond entertainment circles. Neither Hulu nor the show’s producers had any idea when planning the show that they’d be launching in such a hospitable environment. But much as Fox’s 24 got a lift from debuting weeks after the 9/11 terror attacks, at a time when audiences were eager to see tough guy Jack Bauer take on America’s enemies, watching Moss’s Offred face tyranny takes on a special resonance during another period of national crisis. While Hulu — and the Hulu brand — has already benefited greatly from the successful development and launch of The Handmaid’s Tale, Hopkins and Erwich are under no illusion that they’ve somehow now guaranteed the service’s long-term profitability, or even viability, in a rapidly changing TV universe. “If you look at the history of entertainment, often there can be a show that defines a service, but it does not itself make the service,” Erwich cautions. “Because you have to continue to follow up. You can’t really rest on the laurels of one.” This is particularly true at a time when the Next Great TV Show seems to come along now every three or four months. Mr. Robot, a media sensation two summers ago, was supposed to usher in a new era of edgy, boundary-pushing programming for USA Network. Instead, the series lost its way creatively in season two, and the network has yet to debut any successor series worthy of the buzz that greeted Robot’s freshman outing. — Adding ‘Hulu with Live TV.’ In a further bid to differentiate itself from other streamers, Hulu last month launched a new service for cord-cutters which seamlessly blends Hulu’s traditional video-on-demand ecosystem (original programs, library titles, next-day network streams) with the same sort of live-video functionality (including local broadcast stations, depending on where you live) as Sling TV, Playstation Vue, YouTube TV or DirecTV Now. The new platform also boasts a new user interface that allows subscribers to easily jump from watching, say, a live sporting event to a cloud DVR recording of a film from Turner Classic Movies to a new episode of The Handmaid’s Tale. While Hulu with Live TV isn’t dramatically cheaper than some starter cable or satellite packages, Hopkins says the new service underscores something crucial to Hulu’s brand going forward. “We want consumers to know: Hulu gets me,” he says. “They understand what I want, and I know I can find it there in a very easy way. And I think that’s the proposition that we’re building. We want to have your favorite shows — whether we’ve made them or licensed them — and they will be there for you no matter where you are or what device you’re using.” Just as the original Hulu helped pioneer streaming, the live TV service gets Hulu in on the ground floor as consumers move away from Big Cable and opens up another spigot of revenue for the company. — Dramatically scaling up original content. While Hopkins isn’t spending nearly as much money making shows as Netflix’s “Six-Billion-Dollar Man” Ted Sarandos, Hulu is in the middle of a rapid programming expansion. The Hulu CEO says this year’s roster of a dozen or so big-ticket titles is roughly double last year’s slate and that 2018 will see the service grow its lineup another 50 percent. “I think we’ll end up in the 20 premium shows per year range, which is what, putting Netflix aside, all of our major competitors are doing, if not a touch more,” Hopkins says. On tap for later this year or early next: The 9/11-themed The Looming Tower (starring Alec Baldwin and Jeff Daniels); the Stephen King–inspired Castle Rock; Seth Rogen’s sci-fi comedy Future Man; and space-exploration drama The First, from House of Cards creator Beau Willimon. — Bucking the trend toward binge releases. Releasing every episode of a new show all at once is standard operating procedure at Netflix and Amazon Prime. At Hulu? Not so much. 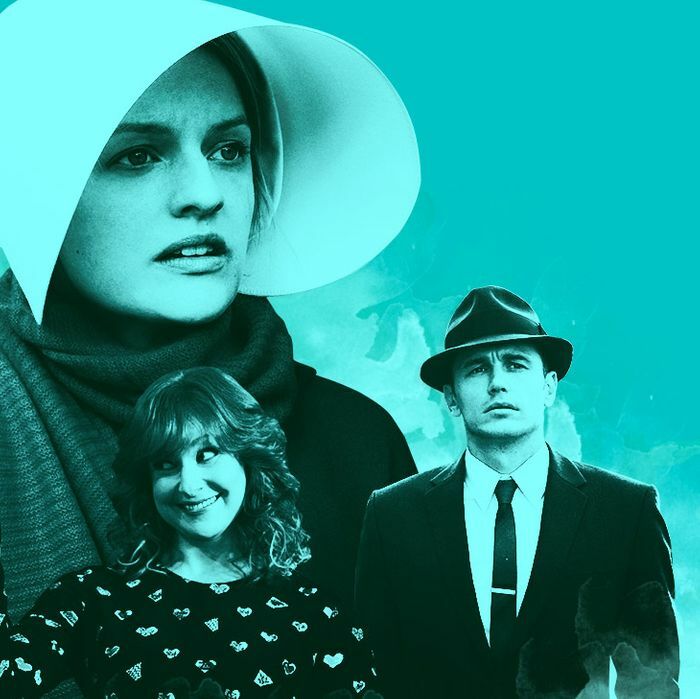 After debuting the first three hours of Handmaid’s on the last Wednesday in April, Hulu dropped new episodes of the show once a week until this past Wednesday’s finale. The streamer’s Jeffrey Donovan fake-psychic drama Shut Eye, on the other hand, had all its episodes arrive at once last December. Hopkins says Hulu will continue to experiment with release patterns, picking whichever one the service thinks best serves the show and audiences. And yet, when pressed further, Hopkins makes clear his preference right now leans toward a traditional weekly rollout episodes. “There’s a certain amount of joy that our research has demonstrated a lot of people get from having something breathe, and come to you on a weekly basis, as opposed to having all of those episodes up,” Hopkins argues. Plus, he adds, “There’s this sort of shared experience that happens when you’re watching the show together — whether you’re physically together, or your friends are watching from wherever they are, and you talk about it later. That shared experience of consuming over time is part of TV — the anticipation of the next episode, and then the conversation that ensues after it. In many ways you lose when all the episodes are up at one time, and then people are watching it at their leisure.” The episodic release pattern also serves another function for Hulu: It keeps its shows in the pop-culture spotlight for a longer period of time, important for a service still evolving its brand. With some Netflix producers now quietly complaining about feeling their shows get buried in the service’s avalanche of content, Hulu’s more-targeted approach might even be a selling point as creators decide where to bring their projects. Particularly in today’s extraordinarily volatile media environment, it’s hardly a given Hulu’s present Handmaid’s-powered hot streak will continue (though its big showing at the Emmy Awards certainly helps). Established media brands once considered invincible — the broadcast networks, cablers such as MTV — are struggling to reinvent themselves, while even almighty Netflix has had to admit recently it can’t keep every show alive forever if viewership isn’t large enough. But with its live-TV play and an attractive-looking slate of future programs, Hulu seems well positioned to take full advantage of the momentum The Handmaid’s Tale has delivered. Blessed be the fruit.